This is actually a rant rather than a useful review of the latest upgrade to the Android version of CoPilot so be warned that it's not going to be especially helpful. A few days ago I was on a bit of a road trip out in Alberta and wanted to use CoPilot to check out a couple of different routes. When it started it immediately went to a screen that said it was applying updates. When it was done it presented a very different splash screen than I was used to. From this point on it was immediately, and painfully, obvious that the user interface was dramatically different. It took me a few minutes to get the hang of finding how to do any of the basic stuff again. This wouldn't have been a terribly big deal if I hadn't been on the road and just wanting to quickly check out a couple of different routes. Instead, I had to relearn basically a brand new navigation program before I could do anything at all. That's how major the interface changes are. My first impressions are that it's a bit simpler to do a few things but it's mostly more complicated to do the majority of things. Routing used to be a breeze to set up simple A to B routes, and even quite simple to set up quite complex multipoint routes. That's no longer the case. I still haven't really got the hang of how to create a simple A to B route. No matter how I go at it I always seem to end up in a situation where it wants me to add more points to the route, and no obvious way to stop adding points and just calculate the route to the one I've already given it. About half the time I seem to accidentally stumble on a way to get it to calculate what I've already given it and show me the route. But it's not obvious enough that I can remember it for the next time!! I got frustrated enough with it that I just used Google Maps and Google Driving for navigation for the rest of the trip. That decision was made even easier because my personal favorites (which I had added to CoPilot as custom POIs) had been removed as part of the update. Since getting back I have not been sufficiently motivated to spend enough time to learn the new interface properly yet. So I can't really say if, overall, it's worth the hassle. I do know that they're getting a lot of flack over the update. Some of it is just from people who didn't see any point in such a major change to the user interface when CoPilot was already doing everything they want it to do (If it ain't broke, why "fix" it?). But a fair bit of it appears to be about things that are genuinely broken or at least inconsistent. A lot of the criticism seems aimed at the routing. Previously there was a pretty obvious way to do simple A to B routing versus multipoint routes. Both were simple and it was fairly straightforward how to access each. Now there is no apparent distinction between the two. Then, to make things more complicated, it seems like they've added a "trip planner" function. The reason this is an issue is that it's not at all obvious whether you are about to get yourself into the standard routing process or into the trip planning function, it's not really very obvious which one you are in once you're working with them, and so it's not really obvious how to end or get out of the process. The good news is that the same process we've documented in a sticky above for adding custom POIs still works exactly as it did before so it only took a couple minutes for me to add my favorites back in. As I said, I need to spend a lot more time working with it before I can give a reasonably unbiased, less emotional, assessment of the real value of the changes. This is just a heads up that the changes are huge and if you have the option you should make sure to make it happen at a time when you won't need CoPilot for navigation immediately. What you experienced with CoPilot is IMO becoming far to common with a lot of other software too. Off the top of my head, Android file managers, as an example... it's bad enough that it takes 3 or 4 different apps to do all the basic that Windows & Mac has done for a couple decades now, but to add insult to injury, it seems like almost every time a new update rolls out, the UI changes are so significant that it's like learning an all-new app. Some day I'm going to find a way to make a youtube video to shame/humiliate the geekbrains behind this never-ending update schemes by making a parallel to the UI in the "real world" and how aggravated geekbrains would be if every time they turned around, somebody changed all the functions of the controls around their house. But on a more practical note, now I'm (not surprisingly) wondering how useful the new CoPilot trip planner is...? I use ES File Explorer file manager. It does even more than Windows File Explorer. It does local files, files on your LAN, cloud services like One Drive and Google Drive, and FTP servers. And more. I've been using it for years, on at least the last three phones. There have been occasional changes to the UI but always to accomodate new functions, never just to change for the sake of change. I'll take a look in a day or two. It's not something I care much about so I haven't put any priority on it. They've made a few fixes to the things people are hollering the loudest about so I've got the regular routing figured. It's a little different still but probably as quick as it used to be, even for multistop routes. ES File Explorer is one of the three I use most, but it absolutely does not do everything Windows File Explorer does. No draq & drop copy or move (another app does that), and no detailed storage space utilization info ("Storage Analyzer" does that). Both ES File Explorer & Storage Analyzer switched to all-new UIs between 2016 and the previous time I used them extensively. The new UIs are different but they aren't an improvement. e.g. ; Storage Analyzer switched from an easily-readable bar graph arranged by size, to a pie chart that gained nothing but is much harder to read, and had to eliminate titles altogether for the smaller 'pieces of the pie.' Only a moron would use a pie chart for something like this, but that's what they did. That's just one example in an ocean of similar UI choices driven by who-knows-what kind of rationale, but it's not helpful. A lot of these updated UIs amount to little more than re-arranging the furniture, and pretending it's a improvement in real-world functionality when what it mostly does is reduce user productivity while they learn the new UI, even though the (limited) underlying purpose of the program doesn't justify *any* new learning curve. If the UI ain't broke, don't fix it, but if that effort is made, do, better be damn sure to not let graphic-artist types (wanna-be or otherwise) anywhere near the redesign, except maybe to pick the color scheme when it's done (and based on what TomTom did, I'm not sure that's such a great idea). It's analogous to why, in the real-world, interior designers do the decorations, and not the building foundations! Beg to differ about ES File Explorer. 1. I've never found drag/drop any faster/easier/more useful in a touchscreen environment than ES's method. Especially for we of the ham-fisted persuasion. 2. ES has an excellent space analyzer. It gives you a bar graph of the top level folders with both percentage and byte usage for each folder and file. If you want the usage for one of the folders you just tap that folder for the same display, down to any folder level you want. It defaults to internal storage and lets you select the SD card if one is installed. Just tap TOOLS > SD Card Analyst in the left (hamburger dropdown) menu. Your very first point, which said you didn't really want/need that feature on a touchscreen device, confirms what I said, that it does not do everything Windows File Explorer does. It doesn't end with that, though. As for some of the other functions, it's nice to know they're there. I'll try to remember to look harder for them next time. Then again, I shouldn't have to do that, and that's also part of the problem with the multi-step 'now-you-see-it, now-you-don't' metaphor that's typically a result of trying to cram in more functionality than will realistically fit on a pocket-size device. ES File Explorer may be adequate for the typically less intense file management needs of most mobile device users, but it's hardly a full-blown substitute even for Windows File Explorer (or the MacOS Finder), much less one of the much better 3rd-party WinOS alternatives. And that's just one of the reasons why people who need to do anything resembling actual work on a mobile device are better off with a different operating system that either iOS or Android. An added bonus: they won't have to learn a bunch of (phone-optimization-driven) idiosyncrasies when their mobile device runs the same OS as their main desktop workstation (or can even BE the same device). But Tim Cook says all we really need is an iPad Pro! As of now, all the "How To" articles I saw on their support site still are for version 9.x. Some people have noticed and complained about the new 10.x UI is that the "drag route" feature has been removed. The flipside of that is that the ability to make a route go through via points that you can chose on a map has been improved. Also, when in the planning mode where the route can be manually altered, 10.x shows almost a full-screen view of the route overview, whereas in 9.x the map was only about half the screen area (the 9.x trip planning screen always showed the directions on the left side). There really isn't anything thing lost by dropping the "drag route" feature since an automatic recalculation has to happen before the new route is not displayed anyway (unlike google.com/maps which shows the revised route almost in realtime). FWIW, routes cannot be revised by dragging them in the Google Maps/Nav app either. (that last part is unlike the Anrdroid & iOS versions)"
CoPilot 10.x (second image below) requires two steps/screens to do what was just one step on 9.x (first image). Looks like this is another example of optimization for phone-sized screens. The 9.x method is easier on a laptop or large-screen tablet. The 10.x method has the advantage of showing a more zoomed-in view of the point being chosen. I have to admit that I didn't even know this method of re-routing existed on 9.x until I found it on the newer version, then checked to see if it was there on the older one too. Another surprise: I've now tested both versions on the same tablet, and it seems to be just as easy to select a point to reroute through on 9.x as it is on 10.x. Previously, I had only tested 9.x on an older tablet, and that must be the culprit behind the finickiness at selecting points on the map. I have tried to read through most of the post which pertain to CoPilot. I think I am going to give it a trial run on my tablet and if I like it will need to consider doing my planning as well as navigating on it rather than planning on my laptop. I can't really find a site to download CoPilot to my laptop anyway. I have one question I did not see addressed. Can more than one trip be planned and saved for navigating at a later date, or on consecutive days, weeks, months? 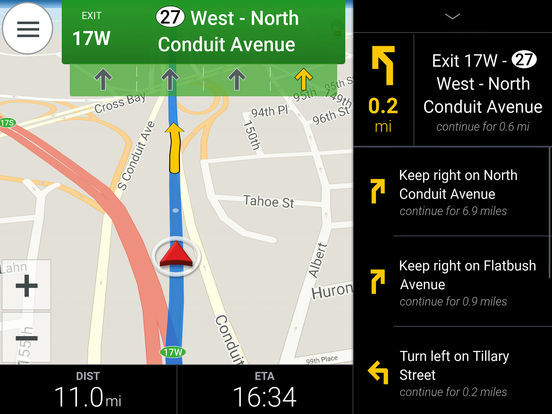 • Add route/trip files to CoPilot Live Android?? ?